It does not matter to me what colors you use or what font you use for the text or anything else. I'm not really picky about that at all. I'm willing to leave that up to the person making this for me. If you have any questions, don't hesitate to ask. Just bumping this as I still need the affiliate button. Thank you! Well, since you weren't being particular I used your forum's background texture and color scheme to make a simple button. If the image is to your liking, please be sure to save it and upload it to an image hosting of your choice. I'll check back in case you need adjustments or anything. 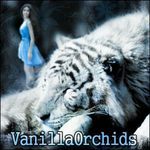 VanillaOrchids, I will definitely be using the button that you made me. Thank you! Thank you! Thank you!